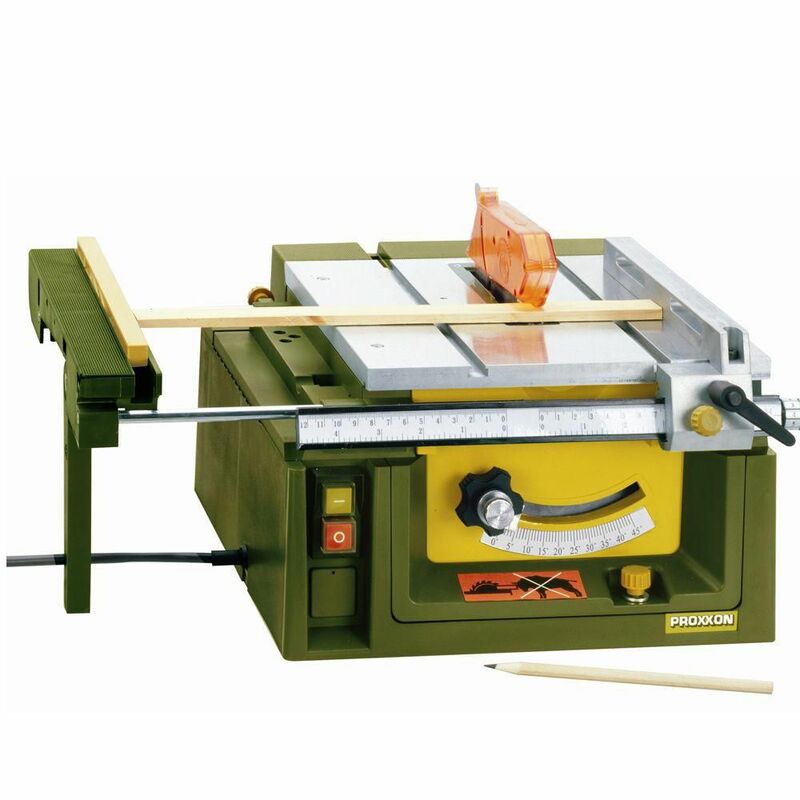 The Proxxon Table Saw FET provides perfectly straight cuts. Designed for fine mechanics, model building, mould construction, toy manufacture, architects, model carpenters and fitters. Appropriate for cutting wood, non-ferrous metals, plastics, Plexiglas, glass fibre reinforced sheets, foam and many other materials. Stable construction because load bearing parts and plane-milled table are made of die-cast aluminum. The General International 14 inch- 1HP Contractor grade Wood Cutting Bandsaw is constructed from Sturdy steel. Sturdy welded steel frame & precision balanced internal working wheels with replaceable tires, means longer lasting and durability. Includes a easy-to-assemble, open-base sturdy steel stand. Includes precision easy-adjusting European style blade guide bearings. Two cutting speeds makes for excellent results in either hard or soft woods. A Miter gauge with aluminum crosscut fence is included as a bonus. Hinged doors and easily accessible blade tension knob, for fast blade changes and adjustments. Extra large designed 21-1/2 inch x 15-3/4 inch cast-iron table for stability and durability. The oversized paddle, safety lock-out on/off switch with removable key, prevents unauthorized use and easy to shut on and off. The bonus, multi-size dust port fits 4 inch, 3 inch, or 2 inch hose. Table Saw FET with 24-Tooth Saw Blade The Proxxon Table Saw FET provides perfectly straight cuts. Designed for fine mechanics, model building, mould construction, toy manufacture, architects, model carpenters and fitters. Appropriate for cutting wood, non-ferrous metals, plastics, Plexiglas, glass fibre reinforced sheets, foam and many other materials. Stable construction because load bearing parts and plane-milled table are made of die-cast aluminum. Table Saw FET with 24-Tooth Saw Blade is rated 3.7 out of 5 by 3. Rated 5 out of 5 by Terry from Great Hobby Saw A great little saw for my needs in building wooden ship models. Very precise once you get to know its operation. Quiet and well built. Rated 5 out of 5 by ttmedford from Dose the job I wanted it to do. Dose the job I wanted it to do.